"Sampath Speaking" - the thoughts of an Insurer from Thiruvallikkeni: Faf innings .. and how did CSK win ??? They kept saying in IPL T20, no target is safe ! ~ yet at Wankhede seemingly small target was daunting – best of CSK fans would have thought of switching off and going to bed ~ yet the result was to their liking. In IPL, no side had lost a wicket off the very first ball of a playoff match before today. Sunrisers Hyderabad provided the first such instance with Shikhar Dhawan getting dismissed by Deepak Chahar. ~ and Harbhajan Singh bowled none in the match – only the second time he did not bowl a single over even though the opposition innings lasted for full 20 overs. The other such instance for him came while playing for Mumbai Indians against Rajasthan Royals in 2010 when he got injured while batting and was thus unable to bowl. Chennai Super Kings grabbed a win by 2 wickets against Sunrisers Hyderabad in a nail-biting finish in Mumbai on Tuesday and made their way into the finals. 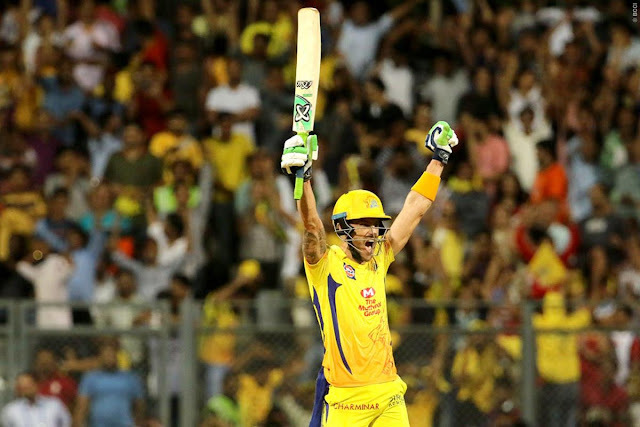 Chasing a target of 140 in 20 overs, CSK were in complete trouble after being reduced to 62/6 in the 13th over but senior pro Faf du Plessis anchored his side to their seventh final in the Indian premier league. CSK needed 23 runs in the last two overs, Shardul Thakur who came in at number 10 dominated Siddarth Kaul. Kaul gave away 17 runs in this over while Thakur struck 15* eventually. That makes CSK’s 7th entry into IPL final. No other side has reached the final more than four times. Faf du Plessis, playing only his fifth match of the season, repaid his captain's faith by playing an innings MS Dhoni himself will be proud of. Chasing 140 CSK were in all sorts of troubles due to excellent bowling, but du Plessis took the game deep, induced a few errors from the opposition captain, and capitalised on small mistakes here and there. Carlos Brathwaite bowled the 18th over, with 43 to get, ahead of Sandeep Sharma and Shakib Al Hasan. Du Plessis hit that over for four, six and four to give an excellent match its final momentum shift. Earlier, CSK bowled to plan and pinned Sunrisers down to 139. Incidentally, it was Brathwaite whose hitting in the final few overs - 43 off 29 - gave Sunrisers something to bowl at. Du Plessis faced just six balls in the Powerplay. He looked inconspicuous during the collapse. Even as Bravo and Jadeja and Chahar fell to make it 92 for 7 after 15 overs, du Plessis kept knocking it around. In between, he hit Shakib for a four and a six in the 14th over to stay in touch with the game. Questions had been raised when Chennai Super Kings used their right-to-match card on Faf du Plessis and let go of a gun death bowler in Andrew Tye. And then, du Plessis played only four games before Tuesday. Come the playoffs, MS Dhoni needed more experience and turned to the South Africa captain. And du Plessis answered all the questions with a vintage 67* that had most of the traits of a Dhoni special: manoeuvring the middle overs, taking the match deep even as wickets tumbled at the other end, and sealing it with a six. In the first eight overs of CSK's chase of 140, du Plessis faced just nine balls for five runs. He watched fellow opener Shane Watson, Suresh Raina, Ambati Rayudu and Dhoni fall around him in that period. After Siddarth Kaul had removed Raina and Rayudu off successive balls, Rashid Khan stormed through the gate of Dhoni with a ripping wrong'un. Rashid proceeded to have Dwayne Bravo nicking behind with a sharp legbreak. When Deepak Chahar joined du Plessis, CSK were 92 for 7 with the asking rate reading 9.60. By then, du Plessis had moved to 38 off 31 balls. Rashid and Bhuvneshwar had one over each left, while Kaul had two. Williamson was left to choose among Shakib Al Hasan, Sandeep Sharma and Carlos Brathwaite for the other over. Du Plessis survived an lbw call off Rashid after a successful review and helped bring down the equation to 43 off 18 balls. Williamson took a punt on Brathwaite and du Plessis launched a calculated assault on him, hitting him for four boundaries in the 18th over. He anticipated slower balls from Brathwaite, maintained a stable base, and unleashed smooth swings. Du Plessis hit 27 off 11 balls from Brathwaite at a strike-rate of 245.45. After Shardul Thakur squirted a brace of edged boundaries and loft off Kaul in the 19th over, CSK needed six off the last. Du Plessis was up against Bhuvneshwar Kumar, one of the best death bowlers in the IPL. He read the slower ball from Bhuvneshwar and nailed it over his head to lead CSK into their seventh IPL final with five balls and two wickets to spare. ~ and that is the Q most would be asking ! !